Patients with fibromyalgia have multiple body aches and feel exhausted all the time, however, showing great respect, the physical examination does not show any obvious abnormality and laboratory tests are normal. Just because of the lack of objective findings, fibromyalgia has been considered a disease of a psychosomatic nature (psychological and not organic). Its recognition as a "real disease" was only obtained in 1987. Despite frequent pains in muscles, tendons and joints, these structures show no sign of disease. Current theories suggest a problem in brain areas responsible for pain perception. The brain of patients with fibromyalgia is overly sensitive to pain stimuli that arrive to them. So if you have pain throughout the body, often feel tired, visited several doctors and none of them could identify a cause, your problem may well be fibromyalgia. Fibromyalgia is six times more common in women and its prevalence increases with age. About 2% of young people and 8% of the elderly population are carriers of this disease. Most cases of fibromyalgia start between 30 and 55. In 50% of cases the symptoms begin after a one-off event, such as a physical or psychological stress. In the other 50% you cannot detect any trigger for the onset of symptoms. People with a positive family history are 8 times more likely to have fibromyalgia than the rest of the population, which strongly suggests a genetic cause. The clinical picture of diffuse pain may involve muscles, ligaments and tendons. Often the patient reports a sensation of swollen joints, which is actually just a sense, since the edema is not proven on physical examination. When asked where it hurts, many just respond: it hurts. They are in constant pain and touches worsen it. Patients with fibromyalgia pain threshold have a lower intensity equal to painful stimuli and are much more felt for those who have the disease. One of the criteria for diagnosis is pain on palpation at 11 of 18 tender points illustrated below. Headache type migraine or tension-type headache is common. Another typical symptom is chronic fatigue. It is a complete lack of sense of energy with heavy arms and legs and difficulty concentrating, sometimes known by patients as "tired brain". It is very common combination of fibromyalgia with chronic fatigue syndrome. Many patients also have sleep-related complaints, such as light sleep and lack of rest after waking. Some studies show that these patients cannot remain in the 4th stage of sleep, which is a deep sleep, also known as a restorative sleep. Other symptoms include memory problems, dry eyes, palpitations, dizziness, irritable bowel syndrome, tingling, constant fluctuations in weight, frequency of urination and mood swings. The combination with depression and anxiety disorders are very common. About 70% of patients with fibromyalgia develop lifelong disorders. Modern studies failed to show that fibromyalgia patients have early signs of brain aging, reducing the gray area (site of the brain where neurons are). However, there are no laboratory tests or imaging to confirm the diagnosis of fibromyalgia. In fact, these tests only serve to rule out other causes of chronic pain. If during the investigation of any laboratory test or imaging (radiography, tomography, ultrasound, etc ...) to detect changes, or if the presence of signs of inflammation in the joints (arthritis) or signs of neurological lesions are detected during the physical examination by doctor, the diagnosis of fibromyalgia should be reconsidered, since these changes indicate the existence of another cause for pain. The big challenge for the physician is when fibromyalgia occurs concomitantly with other diseases that also comes with diffuse pain, such as osteoarthritis, rheumatoid arthritis and polymyalgia rheumatica. In these cases the diagnosis of fibromyalgia is very difficult to achieve. It is important to know that on the one hand, fibromyalgia is not a disease entailing risk of death or causing deformities, on the other hand, symptoms can be disabling, giving a poor quality of life for patients. Patients with fibromyalgia usually have a very bad quality of life, especially if they have an established diagnosis and not under treatment. Ideal treatment is done by a multidisciplinary team of a rheumatologist, a physiotherapist and a psychologist or psychiatrist. Understanding what the disease is, wiping out negative thoughts like "I'll die", "I have cancer" or "this is an infection with no cure" helps a lot to combat the symptoms. In the long term the vast majority of fibromyalgia patients improve their symptoms and can maintain an active lifestyle and a good quality of life. Comments like "this is in your head" or "stop freshness there is nothing wrong with you" is untrue that only hinder the treatment. However, there is no easy or quick cure for fibromyalgia. Don't believe treatments that promise miracles. Aerobic exercise and strength training improve quality of life and decrease the intensity of pain. It is also important to avoid alcohol, cigarettes and caffeine. Several drugs may be used as analgesic, antiinflammatory, antidepressants such as fluoxetine, cyclobenzaprine and antiepileptics. Drugs that help with sleep are also important since one of the current theories is that sleep-related problems can contribute to the onset of fibromyalgia. In 2009, two new drugs were approved with good results for the treatment of fibromyalgia: Milnacipran (Savella) and Sodium oxybate (Xyrem). 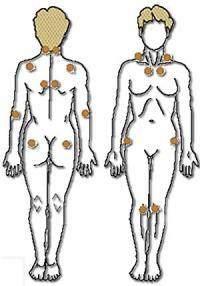 There is no evidence that acupuncture works for fibromyalgia. Just as an example, a study was published in 2005 that examined patients who were divided into two groups. 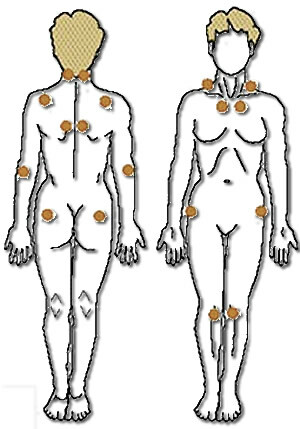 One received acupuncture treatment and the other received placebo (fake acupuncture made with sharp objects that were not inserted into the skin and even encouraged the traditional Chinese acupuncture points). Patients in the placebo group did not know they were using placebo, everyone thought they were being subjected to traditional acupuncture. In the end, there was no difference between the two groups, both showed a reduction in pain in 30% of cases. Therefore, there is clear evidence that, at least in fibromyalgia, acupuncture exceeds a simple placebo effect. Unlike acupuncture, all the drugs mentioned in the previous section showed, by scientific work, being superior to placebo in controlling pain of fibromyalgia.